Doug Miller was born in Succasunna, New Jersey in May of 1969 to Jim and Jackie Miller. Their loving marriage of over fifty years produced 4 children, Doug being the youngest. Doug's three older sisters have provided him with 5 beautiful nieces and 3 handsome nephews. His Father was a furniture salesman and his Mother was a devoted stay-at-home Mom.This allowed her the extra time she needed to drive Doug all over the State of New Jersey to follow his dream of playing soccer. Part of his successful career, he contributes to his Mother. Without her patience and great sacrifice he might not have made it as far as he did. His family still resides in the same area where he originally grew up. Doug’s first real exposure to the game of soccer came early one Christmas morning at the age of 4. We must credit his father with introducing Doug to the game of soccer, as it was his present of a soccer ball that year that started everything for Doug. At the age of 5, Doug begged his parents to let him join the neighborhood recreation center. There he discovered his passion for soccer. He began playing and learning about the sport at the Roxbury Recreation Soccer League. Even at such a tender age you could see the talent Doug possessed. People were impressed not only with the way he handled the soccer ball but how well he interacted with the rest of his teammates. Ironically, Doug’s first coach at Roxbury Recreation, Greg Good, went on to marry his sister and become his current brother–in–law. After polishing his skills with the recreation league for three years, he moved up to the Roxbury Traveling Team where he spent many years touring all over displaying his obvious talent and developing his skills. The first sign that Doug may actually have a future career in soccer came at the age of 14. He was a high school freshman playing on the varsity team, not that common at the time. Despite the fact that the team did not do well, winning very few games, Doug’s determination grew stronger. During his freshman year of high school, the team had a devastating record of 1-16-1. Everyone thought this would hurt Doug’s chances at a full scholarship. Much to his surprise, Doug’s hard work was noticed and he was offered a full scholarship to play soccer for Loyola College in Baltimore, Maryland. Doug’s first two seasons at Loyola College were filled with polishing his skills and achieving growth as a player. During his junior year, his career started to take off. Doug became captain of the team and won many awards. Among the notable awards that Doug received were All-State Honors, All-South Honors and MAAC Conference Player of the Year. Doug graduated with a Bachelor of Arts Degree in Communications and Public Relations. Upon the completion of college, Doug’s dream of playing soccer professionally became a reality. Doug was the number 1 draft pick for the Kansas City Comets Major League Soccer team. Unfortunately, the reality of playing professional soccer was short lived. After being drafted by the Kansas City Comets, the team went bankrupt and folded. This left Doug questioning his decision to play professional soccer versus looking for a job in communications. Doug didn’t have much time to question himself because in October of 1991, the Baltimore Blast Major Indoor Soccer League signed him. After playing only one season, Doug was hit again with bad news. The entire Major Indoor Soccer League had folded. Again, Doug was left to ponder where his future was headed. He had dreamed most of his life of playing professional soccer and both opportunities he had did not last very long. Before he could throw in the towel, the Harrisburg Heat in the National Professional Soccer League picked him up. He played for the Heat for one and a half years. Doug’s time in Pennsylvania’s state capital would give him the experience that would lead him to future success. In March of 1994, Doug was traded to the Cleveland Crunch Soccer team. This would be his first real taste of success. The Cleveland Crunch team went on to win the NPSL championships in 1994 and 1996. He had finally become a part of a championship team. During that summer, Doug returned to playing outdoor soccer for the New York Fever team in the American Professional Soccer League. This time felt different for Doug, he had returned as a pro this time. It was that spirit and his incredible ability for scoring goals that got him noticed by many. The following indoor season with the Crunch turned tragic for Doug. He was forced to take the summer of 1995 off to allow his body to recuperate from his injuries. All was not lost for Doug; one blessing did come out of his time away from his team, a new desire he felt just as strongly about. Doug found that he loved teaching the game and his soccer skills to children. Doug took over as the Director of Team USA Pro-Soccer Camp for children. Just watching the innocence of the children and their immense desire to succeed made Doug’s recovery all that more important. He had a mission; he could not let the children down. They looked up to him and counted on him. But more importantly, they learned from his example. Doug wanted to show them that no matter what life throws their way, they had the power to change the outcome. 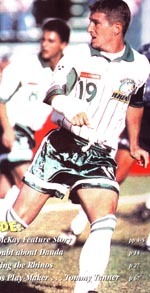 After a lot of hard work, Doug returned to the Crunch the following season and was an integral part of Cleveland winning its second NPSL Championship in 1996. It was near the end of the indoor soccer season that Doug received the call that would make Doug Miller a household name in our city of Rochester, New York. Rochester, New York had not had a professional soccer team since the Rochester Lancers played for the old North American Soccer league in the 1970’s. In 1996, this was going to change. The Rochester Raging Rhinos, an A-League expansion team, was about to start its inaugural season and wanted Doug to be a part of the team. Rochester was ready for a new team and Doug was ready for a fresh chance at playing professional soccer. Doug’s first 12 games did not live up to the expectation of the Rhino’s organization. They expected more out of what they believed to be their new star player. They were not disappointed for long. The turning point came in the sold-out game over 14 thousand Rochester fans will never forget. It was the first game ever played in the new Frontier Field Stadium in downtown Rochester on July 7, 1996. The Rhino’s had gotten off to a poor start against the 1st place Montreal Impact. The Rhino’s were already 2-8 for the season when the looming loss of this game hit the crowd. At half time, the Rhino’s had already fallen behind with the score of 2-0. Doug’s devotion to his fans was the motivating factor for him that day. He was not ready to give up. In the second half of the game Doug came out on the field as if he had something to prove. His game winning score in the last minute of the game was all the crowd needed to make Doug their hero. The win touched off a wild celebration for all the frenzied fans at the new Frontier Field Stadium. Over the next 1-½ seasons, Doug’s career with the Rhino’s skyrocketed. Doug scored 45 goals in 50 games. He no longer had anything to prove to anyone, for he had finally made it in the big league. Despite the hard work of Doug and his teammates, the Rhino’s came up short in the A-League finals and the U.S. Open title game against the D.C. United. Despite losing the two championship games, Doug still managed to achieve success. He was named League All-Star for scoring 18 goals that season. Doug decided that he had found a new home here in Western New York. One motive for staying in the area was the Buffalo Blizzard Indoor Winter Soccer team picking up his rights. Doug went on to lead the Blizzards in scoring for the 1996 – 1997 season. His talents on the field led the franchise to their first Northeast Conference Championship. This also led to a 4 year guaranteed contract. In the 1998–1999 season, Doug led the league in goals and scored 192 points for the team. The 1997 outdoor season with the Rhino’s started out very slow for Doug. After scoring in the season opening win against Hershey, Doug was having a hard time finding the net, not scoring for the next 6 games straight. Knowing that he was letting his fans down was tough. "Insignificant" was not how Doug wanted to be remembered so he stepped up his game. Doug went on to net 22 goals in the next 18 games. That season turned out to be the best season of his Pro career. Doug was named MVP of the expanded A-League Outdoor Soccer League. Miller’s 23 goals were the most scored by a player in the 90’s. Despite the incredible year that Doug had, the Rhino’s went on to finish the season with a 14-14 record and were eliminated in the first round of playoffs to the Long Island Rough Riders. The 1998 season with the Rhino’s was not as good for Doug. He had played the end of the prior season with a knee injury and it continued to limit his playing time during the 1998 season. Doug managed to conquer his adversity and put the ball in the back of the net more than once when it counted the most, during playoffs. The Rhino’s did finish the 1999 season winning the US Open Cup Championship, Doug having scored the winning goal. Doug continued to play for the Rhino’s until the end of the 1999 season where they lost in the A-League championship. Doug returned to playing for the Buffalo Blizzard’s indoor soccer league and remained with the Blizzards until the team folded in the summer of 2001. 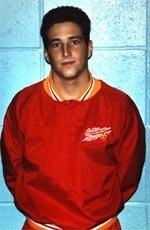 Near the end of the outdoor soccer season in August of 2001, Doug joined the Hershey Wildcats. Doug’s first year with the Wildcats resulted in the team finishing 1st in their division and 2nd in the league. During the championship finals against the Rhinos, the Wildcats just couldn’t score when they needed it the most resulting in a win for Doug’s old team. This was not the way Doug pictured the end of his professional career. In December of 2002 Doug's career was reborn. He was reunited with his old club the Rochester Rhinos. The season was filled with excitement as he led his team to the playoffs again. Doug finished 2nd in the league in scoring and was voted MVP of the team by his teammates. Although the season ended in a semi-final loss to Charleston, it was a fantastic return to the professional ranks. Doug is looking to return to the Rhinos in 2004. In October of 2005 Doug played his final game for the Rochester Rhinos against the Richmond Kickers. Doug scored on a penalty kick to close out his professional career. A year later the Rochester Rhinos retired #19 in an emotional ceremony for Doug and his family. DMS United Academy was established in 2005 and continues to grow today. The principles of DMS are Desire, Determination, Dedication, Respect and Integrity. This is the foundation of our program that develops players on and off the field. In 2009 Doug decided to purchase the Rochester Sports Dome in Spencerport NY and establish a year round soccer and golf facility. You can check out Doug Miller Family Sports Park at www.dougmillerfamilysportspark.com. The Rochester Business Journal featured Doug in their article. You can read it here. In November of 2011 Doug Miller came out of retirement at the age of 42 to play for the 2011-2012 Rochester Lancers, the newest Rochester professional team to play in the newly established MISL. If there were any doubts as to whether or not he could still play, Doug answered them quickly and emphatically. He scored 25 goals and totaled 66 points for the season. Doug was named team MVP making him an MVP in three different decades. Again in 2013, Doug was named the MISL goal-scoring leader and League MVP. DMS has grown to its largest size ever. With 20 teams and 350 players the program is filled with potential and possibility. The introduction of DMS's Youth Development Program promises greater access for the area's youngest players to the best training evironment in Rochester. Doug Miller resides in Greece, NY with is wife of 15 years, Kari, and his two daughters, Kayla and Kalista.